Durban - As the popular Bay Union Open Ocean Surfski Challenge reaches its halfway mark, the progress and attitude of the young men and women from the series’ development programme has been a major talking point of the series. The Sunday morning 12km and 6km races feature some of the best surfski racers in the world, but there is strong drive, supported by the sponsors, to train and encourage the next generation of the sport's stars. In the build-up the the four race series there is frenzy of activity in the development squad, which is made up of young boys and girls from communities of Umgababa and Umnini, coached by Mhlengi Mngadi. 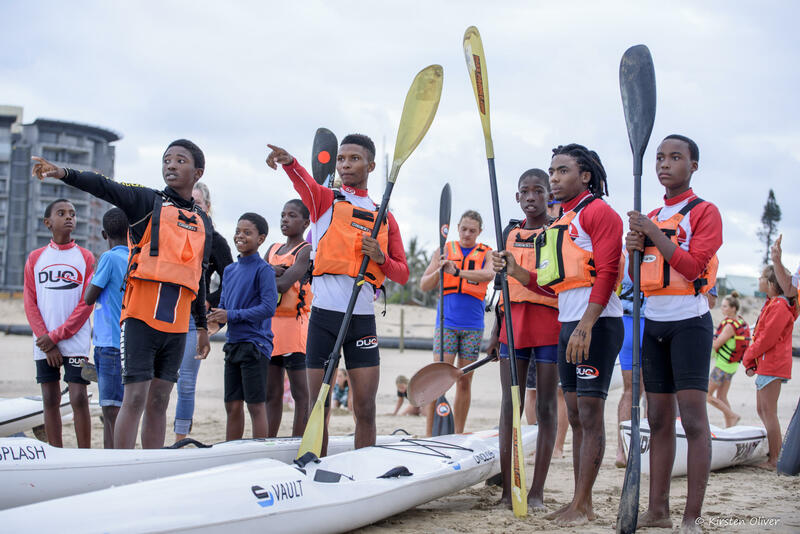 The youngsters, who have been identified by Canoeing South Africa's development co-ordinator Janet Simpkins, started training for surfski paddling last year, visiting the Vetch's Reef-based club once a week. By the end of their maiden series, the passionate young paddlers were regular visitors to the podium in the short course races, and eager to extend their skills and endurance test to the more competitive long course races. In the first two races of the 2018 series Paulos Shozi has raced into very impressive long course top ten positions, in races won by world class paddlers Andy Birkett and Hank McGregor. With Bay Union backing the successful programme, the eleven-strong squad, ranging from 11 to 25 years of age, has set it's sights on lofty goals of getting half of their paddlers into the top ten in the tougher long course events. Their progress this season has been all the more remarkable because their regular training base on the river at Umgababa has been hampered because of damage suffered to the Umgababa River estuary by the last floods. "Instead of being able to train four or five times a week, they have been relying on their one day a week at PWC with Point Watersports Club coach Mitchell Tees, which makes their results really impressive," said PWC's Jacqui Boyd. "Having witnessed the paddlers in action on the water over the past two Sundays as part of the Bay Union Open Ocean Surfski Challenge, both their enthusiasm and the way that they have embraced the sport is amazing and heart-warming in equal measures," said Dave Pearse CEO of Bay Union. The Umgababa development squad was founded by Swelihle Ndlovu in 2007, when he was a member of the Amanzimtoti Canoe Club, with the help of local Mike Chiazzari and the KZN Canoe Union. When Ndlovu moved on to become the swimming coach at the Sharks Board Mngadi took over as coach of the squad.